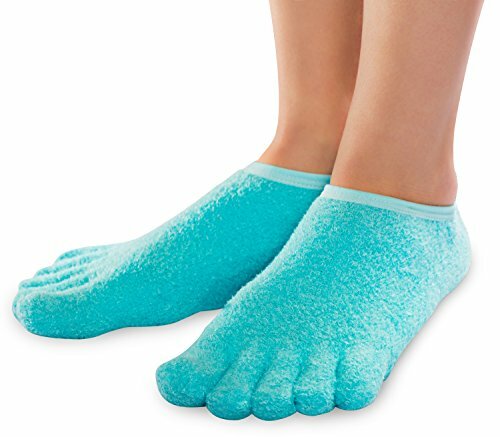 With the NatraCure 5-toe moisturizing gel socks you bring the spa into your home. Dry toes and feet become soft and supple with our dermatologist-tested moisturizing gel five toe booties. The moisturizing gel lining releases medical-grade mineral oil that helps repair dry, cracked toes and heels. Just slip on these comfortable booties and wear them around the house, or wear them to bed! Use them alone, or for a more intensive treatment, use along with a skin moisturizer. Also see our Heel Sleeves or Vented Heel Sleeves. DEEP MOISTURIZATION: Hydrates and softens hard, dry, rough feet, calluses, heels, toes, and cuticles. SMARTGEL INNER LINING: USA-Made SmartGel formulation slowly releases botanical oils and vitamins for an at-home spa treatment. Fits Women's sizes 7 to 10 and Men's sizes 7 to 10. Hypoallergenic. Washable. Wear at least 2-3 times per week. Daily use recommended. Use with a moisturizer for more intense hydration. IN BETWEEN TOES: Encloses each toe in moisturizing gel for the maximum skincare treatment.